When trimming an oak tree, or Quercus, you must choose the appropriate time. You prune an oak tree to sustain its health, provide a safe immediate environment and create an aesthetically pleasing tree. You will find the proper timing by considering several factors that affect the health of the particular tree being trimmed, as well as the trees in the surrounding areas. Although you prune many trees in the spring, the health of an oak tree requires pruning at a different time. When an oak is pruned in the spring, summer or fall, sap is secreted from the wound. This fresh sap then attracts beetles, which may be infected with a number of life-threatening diseases. 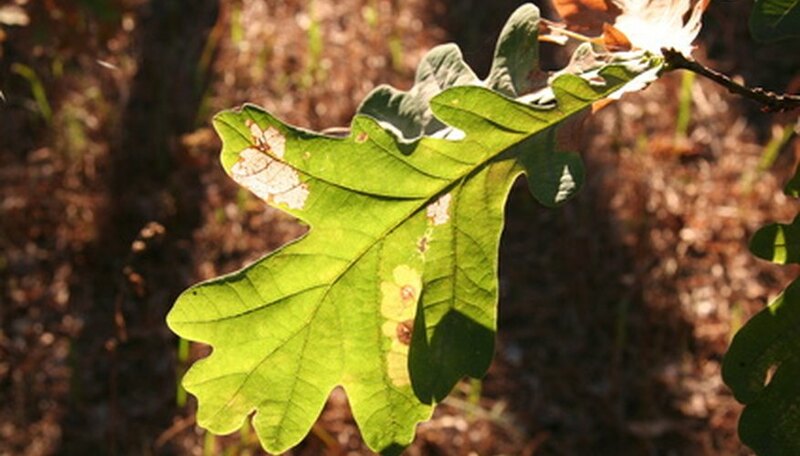 The greatest concern for infection involves the fungal disease oak wilt. After exposure to oak wilt, many oak trees will die very quickly. To avoid oak wilt and the spread of many other diseases, only prune an oak tree in the winter when it is dormant and will not secrete sap. As well, removing diseased or insect-infested wood is easier during the winter because there is no foliage to hide unhealthy wood. By choosing to trim in the winter, you can do a more thorough job, avoid infection, resulting in a healthier tree. Because oak trees are often focal points in landscapes, humans or human development often occupy their immediate surroundings. Choosing to trim oak trees before they present any immediate danger, as well as when there is little activity nearby, is important for safety. Consider removing branches that may break off in severe weather or grow into buildings or wires in the coming spring. Consider the proper timing to maintain a beautiful oak tree after trimming. If you follow a regular maintenance schedule, with trimming taking place every winter, you can maintain natural beauty. A neglected oak tree can become difficult or impossible to prune. Therefore, trimming should begin before the tree has reached the maximum size for the space occupied. Harmony Koiter has over 11 years of experience in the horticultural industry and has published gardening-related articles online since 2006. She achieved a Bachelor of Science in environmental science at the University of Guelph, then studied to become a Certified Horticultural Technician at Vancouver Island University. Along the way, Koiter became a certified PADI Rescue Diver.